I’m currently blogging in my hotel’s lounge because my family decided to hit the hay at 10:30..and I’m just not ready to snooze. Therefore, it is time to update you on the day! We are in Nashville for the week helping my sister move and settle into her new apartment near Vanderbilt. 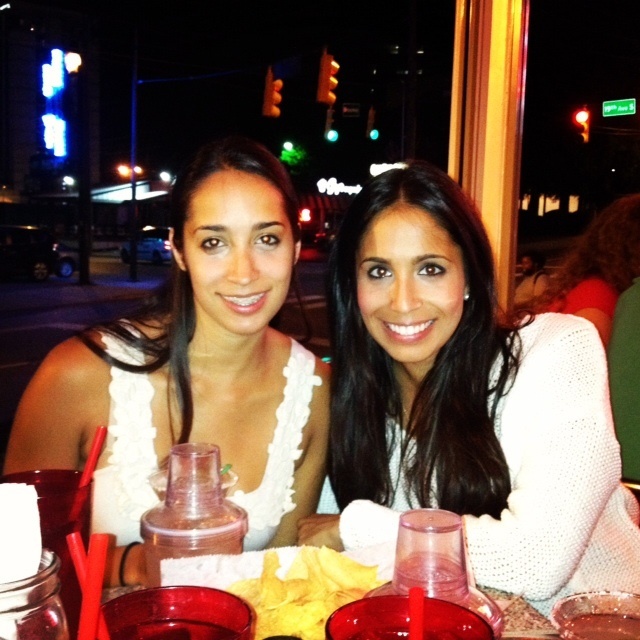 Even though we have spent the majority of our time so far on moving Kiran, I am already in love with Nashville! The atmosphere is incredibly lively and friendly. I can’t wait to see more of the city and experience the best of the country music’s capitol! This morning started with a workout. My entire family woke up early to squeeze in a sweat sesh. My parents opted for a power walk around the neighborhood and my sister and I hit the hotel fitness center. Since today was cross training day for 1/2 marathon training, I rode the bicycle for 25 minutes and then completed Tone It Up’s Tone It Up in 30 workout..minus the running part. 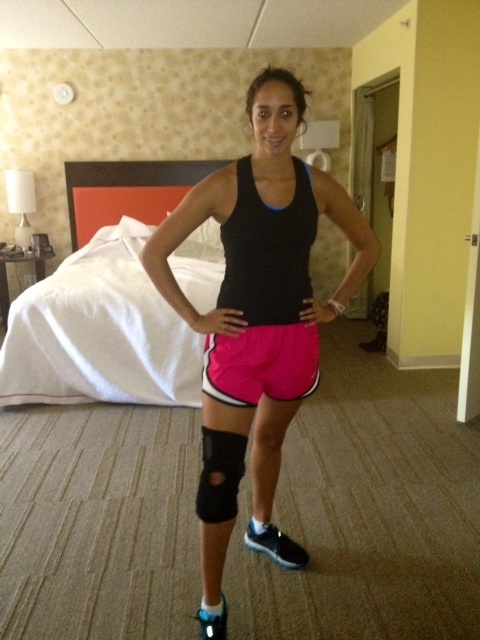 I added a little companion to my workout this morning: a knee brace! I decided to try wearing a knee brace to add support to my knee since the side of my right knee is beginning to hurt. I was pleasantly surprised at how much support the brace offered! My knee didn’t hurt at all during the workout so I was all smiles afterwards. The rest of the day consisted of lifting heavy furniture and shopping for Kiran’s apartment. After a long day, we came back to the hotel to relax a bit before going to dinner. 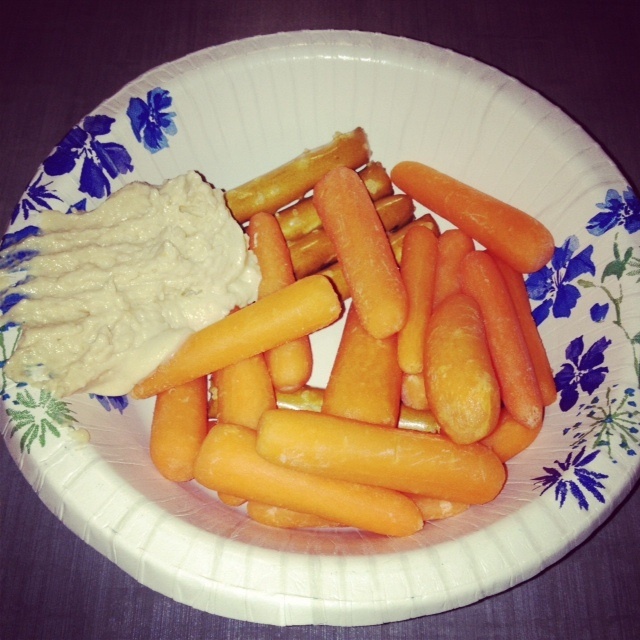 I quickly dug into our groceries and fixed up a bowl of pretzels, carrots and hummus. If your hotel room includes a fridge, definitely take advantage to fill it up with healthy goodies! Having the option of veggies over chips will help you stay on track throughout your vacation. The above bowl of munchies was accompanied by a glass of chardonnay served in a coffee mug (That’s all we had!). For dinner, we ventured down the street to a Mexican restaurant called Chuys. We all indulged a bit and ordered margaritas and mojitos. Mom and I split the chicken fajitas and after having one I was stuffed! 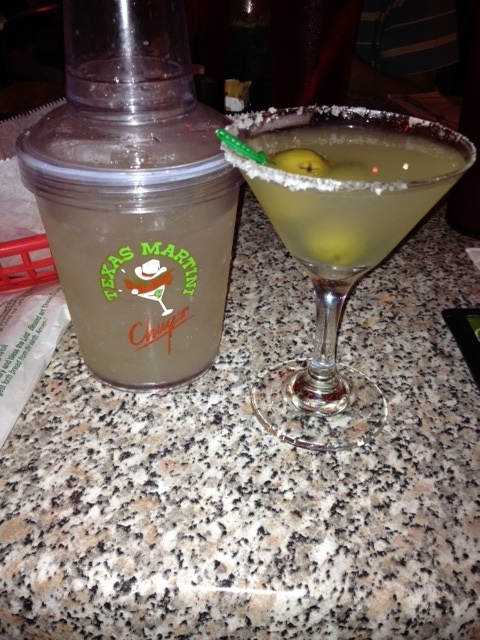 Although I love me some margaritas, I gave my dad the other half of my drink because I was too full. After dinner we headed back to the hotel where my family immediately passed out. Tomorrow will kickstart with a power walk around Vanderbilt’s campus. I love exploring college campuses and can’t wait to see where my sister will spend the next 2 years getting her Masters degree! Hope your knee starts to feel better! Miss ya, love ya! !